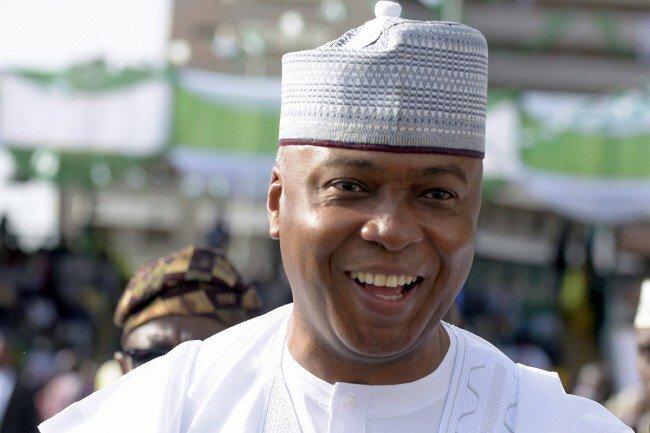 The Senator representing Bauchi Central, Isa Hama Misau and his colleague Rafiu Ibrahim, who represents Kwara South have warned Senator Abu Ibrahim (APC Katsina South) not to foment any trouble when the Senate resumes on September 25, as the Senate President, Dr. Abubakar Bukola Saraki will never resign from the position. Misau and Ibrahim, in a joint statement, claimed that the Peoples Democratic Party, which they and Saraki now belong, has the majority in the upper chamber and as a preliminary to settle issues, they will call for a head count. The statement was circulated on their behalf by Olu W. Onemola, who works for Saraki as media assistant. While the two senators claimed APC has 48 members, a list published by the APC shows that the party has 52 members, after the defection of Saraki and a dozen others from APC to PDP. Promising fire for fire, Misau and Rafiu Ibrahim vowed that Abu Ibrahim and his APC colleagues will meet their match if they tried anything illegal even with all the deployment of security forces which they might have been assured of by the executive arm of government. "It is obvious from the statements of Abu Ibrahim that he and his cohorts are not democrats. They do not believe in rule of law, the provisions of the constitution, the standing order of the Senate, parliamentary procedure and the due process. “How will a supposed democrat be threatening disruption of peace in the parliament because his party lost members and lost its majority status? “Our colleague from Katsina State has equally demonstrated that even though he has spent four terms in the legislature, he has not imbibed parliamentary ethos. Even his knowledge of the provisions of the law and the Senate rules is suspect. That is why he misrepresented the provisions of Rule 12 order 1, 2 and 3 of the Senate about the process of reconvening the Senate after it properly adjourned. By the provision, without all the leaders of the four parties initiating the reconvening of the Senate before the adjourned date, nothing can legally happen. Also without the consent of the Senate President, nothing can happen. “Abu Ibrahim and his cohorts have shown that they are desperate to win the 2019 elections at all cost by all means. We are surprised that this defection is making APC so uncomfortable that they are ready to bring the country down because some Senators left their party. We gave them all the opportunities to make amends from their destructive, non-inclusive and dictatorial ways. They did not take the chances and were behaving as if nobody matters. They are running a government by cabals, serving selfish interests and forgetting all the promises the party made to the people before being elected into office”. the statement read.